The tale of Walter White is coming to a close as AMC has announced that Breaking Bad is ending with season five. But, how will the last episodes do in the ratings? Will they do so well that AMC will regret not trying for a sixth year? The current cast of this gritty drama includes Bryan Cranston, Aaron Paul, Anna Gunn, Betsy Brant, Bob Odenkirk, Dean Norris, Jonathan Banks, and R.J. Mitte. Below are the most recent ratings for Breaking Bad on AMC. The fifth season of Breaking Bad airs on Sunday nights. There are 16 final episodes that will be split between the summers of 2012 and 2013. Final season averages: 2.2 rating in the 18-49 demographic with 4.32 million total viewers. 5.3 demo rating (+56% change) with 10.28 million (+56% change). Season averages: 2.17 in the demo with 4.32 million. 3.4 demo rating (+6% change) with 6.58 million (+3% change). Season averages: 1.97 in the demo with 3.92 million. 3.2 demo rating (+23% change) with 6.37 million (+25% change). Season averages: 1.86 in the demo with 3.73 million. 2.6 demo rating (+18% change) with 5.11 million (+16% change). Season averages: 1.76 in the demo with 3.52 million. 2.2 demo rating (-12% change) with 4.41 million (-9% change). Season averages: 1.69 in the demo with 3.39 million. 2.5 demo rating (+4% change) with 4.85 million (+2% change). Season averages: 1.65 in the demo with 3.30 million. 2.4 demo rating (-17% change) with 4.77 million (-19% change). Season averages: 1.56 in the demo with 3.14 million. 2.9 demo rating (+123% change) with 5.92 million (+113% change). Season averages: 1.47 in the demo with 2.96 million. 1.3 demo rating (-7% change) with 2.78 million (-7% change). Season averages: 1.29 in the demo with 2.59 million. 1.4 demo rating (+8% change) with 2.98 million (+6% change). Season averages: 1.29 in the demo with 2.57 million. 1.3 demo rating (0% change) with 2.81 million (+13% change). Season averages: 1.27 in the demo with 2.50 million. 1.3 demo rating (+8% change) with 2.48 million (+8% change). Season averages: 1.26 in the demo with 2.44 million. 1.2 demo rating (+9% change) with 2.29 million (+4% change). Season averages: 1.25 in the demo with 2.43 million. 1.1 demo rating (-8% change) with 2.20 million (-4% change). Season averages: 1.27 in the demo with 2.47 million. 1.2 demo rating (-20% change) with 2.29 million (-22% change). Season average: 1.35 in the demo with 2.61 million. 1.5 rating in the 18-49 demographic with 2.93 million total viewers. Season average: 1.50 in the demo with 2.93 million. What do you think? Do you still like Breaking Bad TV series? Are you disappointed that the show is coming to an end? Breaking Bad: One Big Final Season or Two Small Ones? I tried watching the first five episodes off of Netflix but gave up on it as it just was about a guy making one stupid choice after another. Yeah… no bad choices in Oedipus, or The Great Gatsby, A Tale of Two Cities, Mutiny on the Bounty, War & Peace, etc., etc., etc., etc. Have you read ANY great literature in your life? More like overrated Depressing literature. Literature and TV shows do not have to be negative and depressing. We need them to be entertaining. I am stunned that a show of that quality is taken off the air! I can’t understand the choice AMC made, anyway it’s all over now. a show that’s is better than Dexter, Ray Donavan etc. Hoping that AMC will come to their senses, I will be hoping for a rebirth. This is awful. Cast list is not up to date, and Vince Gilligan is ending the show on his own terms. AMC has nothing to do with it. This is the biggest television show in history and a TV website can’t even report a paragraph about it accurately? I just discovered the series last week, started watching it on Netflix 4 days ago and am on episode #30 right now. Please…please…keep it going. Just like sholanda down there, my brother introduced me to this show after the 4th sseason and after I saw 2 episodes, I couldn’t stop watching. Every other show is nothing compared to Breaking Bad. I watched 16 episodes in one weekend. So disappointed to hear there wont be a 6th season. 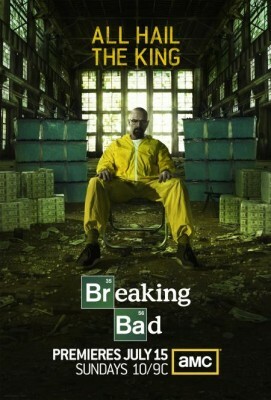 Breaking Bad is the very best of the best, when it comes to entertainment. My brother introduced me to it at the end of season 4. Luckily i have netflix and was able to go back and watch every other season. THIS IS THE ONLY SHOW ON TV THAT I CARE ABOUT. PLEASE COME BACK FOR SEASON 6. MY ENTIRE FAMILY IS INTO THIS SHOW, AND WITHOUT IT, I WOULD HAVE NOTHING TO WATCH. SEASON 6 IS A MUST ! Really cant care less about the ratings on this show, good or bad. Every. Single. Person I know that watches it watches it either off DVDs or off the net (legally and illegally). I myself don’t own a TV but treat my Breaking Bad DVDs like gold. This is not the type of show that advertisers will ever get much out of. But audiences will. Michael Monk » Thanks for catching that!